WAFO contains many routines for general statistical analysis. Of particular interest in wave and load analysis are the routines for extreme value analysis and prediction. There are the classical techniques based on Weibull and Gumbel plots as well as the modern technique based Generalized extreme value distributions, Generalized Pareto distributions with Peaks over threshold (POT). Here are standard plots on three different probability papers of observed Hs, significant wave height, for the winter months over 7 years in the Atlantic Ocean. 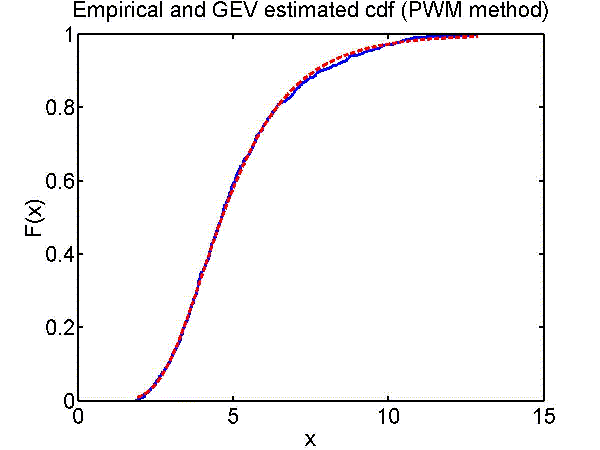 The empirical distributions function for the same Hs-data together with an extimated Generized Extreme Value distribution. The estimation methods is by Probability Weighed Moments. 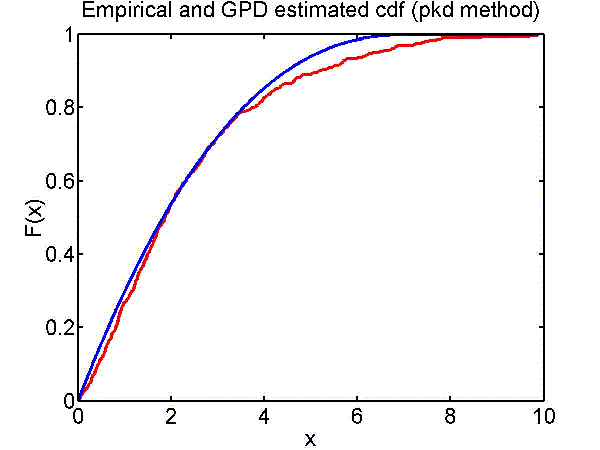 The same data but here we have fitted a Generalized Pareto distribution (GPD) for those Hs-values that exceed 3 m, estimated by Pickands' method. The fit is not particularly good. Here we have fitted the GPD only to those Hs that exceed 7 m. Now the fit is almost perfect. This is in agreement with general statistical theory, which says that "almost all" distributions are GPD in the tail, i.e. for large values. 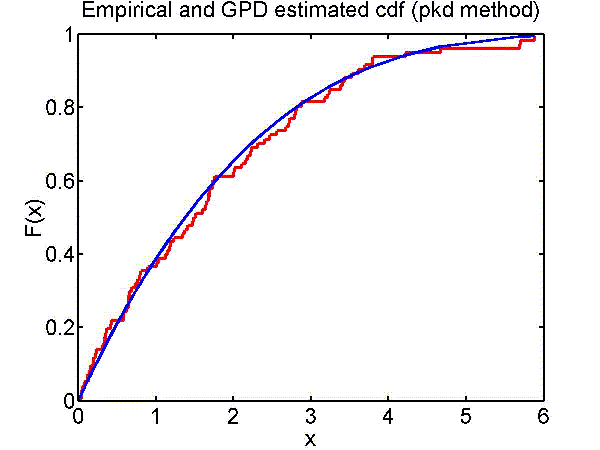 We could safely use the GPD to predict high values. (The values of the x-axis are the exceedances over 7 m; thus we can reasonbly well estimate the distribution for Hs in the range 13-15 m.
In the POT method one identifies those values that excced a high levels u to see if the exceedances follow a GPD. 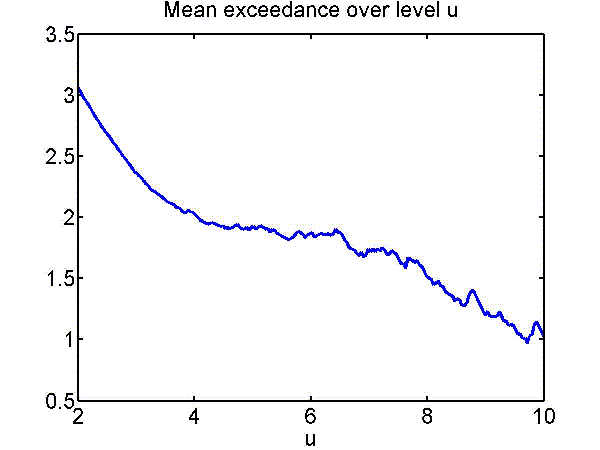 A linear Mean value of exceedances is an indication that the GPD may be appropriate. Here the exceedances over 6 m seem to agree with the GPD model. After having identified a GPD for the exceedances over a level u, here chosen as 7 m, one counts the frequency of such exceedances over the studied priod, and extrapolates to the probable extreme value distribution over an extended period of time. 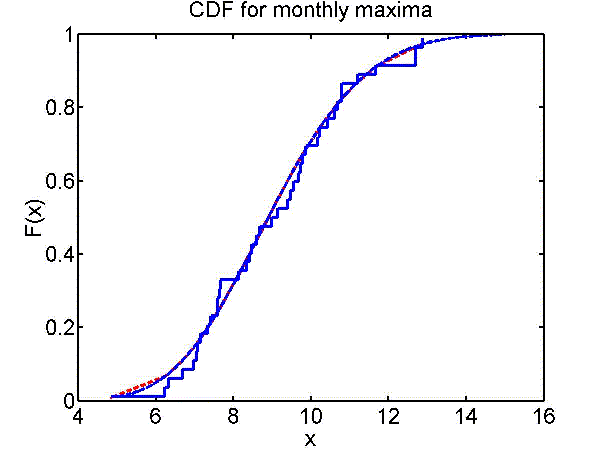 The figure shows the empirical distribution function for monthly maxima, together with the POT and GEV-fitted distributions.